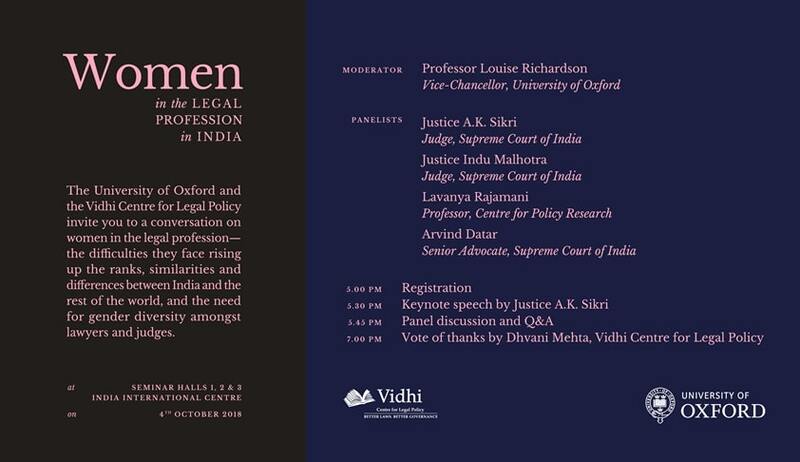 Vidhi Centre for Legal Policy and the University of Oxford are organizing a panel discussion on ‘Women in the Legal Profession’. The objective of the event is to identify the underlying causes that prevent women from being represented in both the higher and lower judiciary and start conversations about the need for gender diversity amongst judges and lawyers. Justice AK Sikri, (Supreme Court of India), Justice Indu Malhotra (Supreme Court of India), Mr. Arvind Datar (Senior Advocate, Supreme Court of India) and Ms. Lavanya Rajamani (Professor, Centre for Policy Research) will be the panelists for the discussion. The discussion will be moderated by Prof. Louise Richardson (Vice Chancellor, University of Oxford).